Madelaine, do you remember the night we met? It was right after I graduated college and we had both ended up in that underground ‘music venue’ which wasn’t anything more than a sweaty concrete room with bad acoustics. The people who’d dragged us in had abandoned us both and though neither of us actually said it, we both thought, “Wow, she looks like she wants to be here as much as I do. Which is not at all!” You handed me a green-labeled Session and a pair of earplugs. We’ve been friends ever since. I don’t know how to summarize or highlight what makes you so great, Madel. How can I condense your multitudes into a single blog post? How can I write about how remarkable you are without producing a laundry list of clichés? I feel about you the way Leslie Knope feels about Ann Perkins. Oh, Madelaine. You magnificent middle school marching band. You moved away a few days ago and I’ve been handling it by having crying jags on your green couch, which now lives in my apartment. In fact, I’m sitting on it now, wrapped in that blue blanket, watching my window well fill with hail. 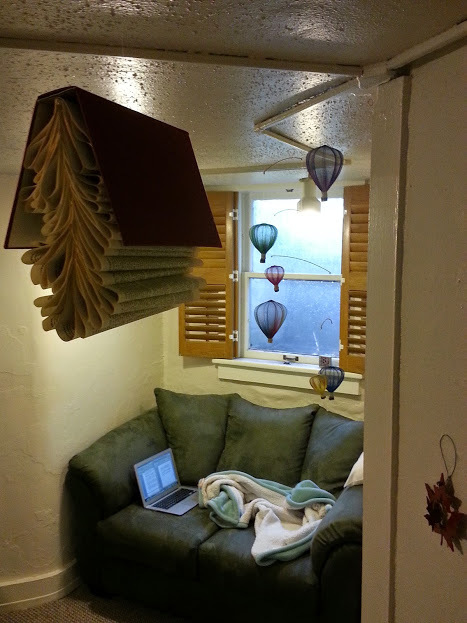 Actually, here’s a picture of the reading nook you helped me create. I love that I can sit on your couch and look up at the balloon mobile we found in Albuquerque and the book mobile you made me. 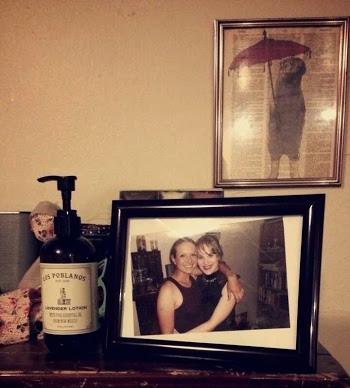 I just checked and the inscription you wrote says, “For my dear friend Lydia, I absolutely cherish you. –Madelaine, Christmakkuh 2012. So maybe I should stop here because that probably says everything, doesn’t it? A few weeks after we met, we had this totally heartfelt and hilarious rooftop conversation about how we had the first really real friendship that either of us had yet had in our strange White Yuppie town. People kept calling for us to come in and I remember you saying, “You can wait! WE ARE BONDING UP HERE.” I think that’s one of the most important things I’ve learned from you: to put friendships first, that everything else will keep. I’ve always admired how self-assured you are. You ooze confidence. Sometimes that gets us into trouble, like when we accidentally lit your entire kitchen on fire because we were… perhaps a little too confident. I’ve always known that caring about what other people think is a waste of time, but I’d never known anyone to really and truly not care what other people think until I met you. You’re so you and so comfortable with your own person, but you’re not mean or cocky in any way. You’re thoughtful and loving, and go out of your way to do nice things for people. I really wish some of the idiots we’ve known along the way would recognize and appreciate those traits more. Like, you’re so good at everything you do but you’re never haughty about it. You’ll get up at four in the morning and toss around hundred pound hay bales like they’re feather pillows but are still genuinely proud when I tell you I did nothing all day but run a super slow 5K. And speaking of super slow 5Ks, you’re always at least half a mile ahead of me when we run together. When we did that Sweaty Sweater race, you finished at least fifteen minutes before me (I’m the slowest runner, y’all) but you were waiting at the finish line, cheering me on and not at all disgusted by my snail’s pace. When I almost made you miss your flight because I forgot to take the airport exit on account of being wrapped up in a discussion about bagels, you weren’t even mad. When you got the single coolest job possible and embarked on your new jet-setting, world-travelling life, you didn’t ever brag or make me feel bad for being, um, super ambiguous about my future. I don’t think anyone has ever believed in me the way you believe in me, Madel. When I’m uncertain, self-conscious, or super depressed, you’re always there to say, “But, you’re Lydia Bagels Page. You can do anything!” (By the by, I had the graduation announcer read my middle initial as B for Bagels mostly because I knew it would crack you up.) As you know, I am literally allergic to the sun. I’d always been self-conscious about how this makes me one of the whitest white people around, but then one time you said, “I never thought pale people could be pretty until I met you.” That is hilarious and also a highly treasured compliment. You’re really good at saying hilarious and meaningful things. I tend to speak in convoluted metaphors, like the time I rationalized a breakup via ampersands, or the other time I compared you to a bagel and cried. In general, I cry approximately twice a year. The past few days bookending your move have been a total sob-fest, which is very confusing for me. Like, I can’t really comprehend where I’m supposed to put all these feelings?? I think you’ll get that, because you’re the only person who’s always totally understood my brand of extreme love meets low expression meets weird depression. I love that I can just say, “My fish are especially dead today.” and you’ll know exactly what that means and how it feels. I don’t like that we share some similar traumas (because we shouldn’t have ever had to deal with those abuses) but I do like that we can talk about them frankly. Having someone (you may be the only one?) so thoroughly and unquestioningly on my side has been a total game-changer. There was that time I’d had a particularly virulent row with that dumb white guy who thought he was entitled to hang out, uninvited, on Native American reservations because “they’ll want to find common ground with me.” I called you because I was so mad I could hardly see straight and I desperately needed to vent. You said, “This is such good timing because I bought us a present and they just came in the mail.” A few minutes later, you were at my house with these matching bracelets, to be worn whenever we need to call upon the strength of 10,000 feminists. Speaking of dumb white people, you’ve helped me become less of one. I’ve learned so much from you just by listening to you talk about navigating your life and identity, about what it’s like to be both Hispanic and white-passing, especially in your labor-intensive industry. I’m a much better feminist because of you. You never think it’s weird when I need to do an extensive critical analysis of TV shows. To this day, you’re the only non-family member who’s ever heard my impressive variety of accents and impressions. You don’t think it’s weird that I’m obsessed with your hometown. You don’t make fun of me for that chard/wine incident. You practically carried me home after my IUD insertion, then stayed and made me soup and let me whine about the sexism that landed me in such pain. You let me come over and write my thesis while you made me dinner. You cracked up when I gave you a sympathy card for graduation. You are right there with me on all our fangirl-ish Mr. The National feels. You don’t think it’s weird that I live in a land-locked state but have distinctly nautical sartorial impulses. You totally support my lady-blazer lifestyle. You were one of the first vocal supporters of this little blog. You just overnighted me a bagel, and it was the best bagel I’ve ever had. Madelaine, you’re every kind of wonderful, the very best friend I never deserved to have. Yesterday, I was listening to This American Life. Toward the end of the “Call for Help” episode, Chana Joffe-Walt says, “Maya loves Charlotte. She loves her. She feels the feelings that come when you are a girl and you have a friend that makes you laugh, and thinks about you when you’re apart, and gets you. It’s not a romantic love. But if you’ve had this, you know it feels just as important.” And it does. It does feel just as important. What a tribute. I have had a friend like this. And then she was gone. Things were never quite the same without her. Now that I think about it, this has actually happened to me more than once.. Different friendships but equally amazing and essential. I guess I should feel lucky to have had such friendships, but mostly it makes me sad to think how lives move on and priorities shift. I comfort myself by thinking that just because relationships are in the rearview mirror doesn’t mean they didn’t matter. You know how the sign says “Objects are closer than they appear in the mirror”? Maybe that’s just wrong. Maybe they’re exactly the size they seem to be..